When the first leaves drop from the trees, it’s time to begin training for the Ghostly Gallop 5K, our annual fall fundraiser. This will mark the 17th year of running (and walking) in this community-wide event. 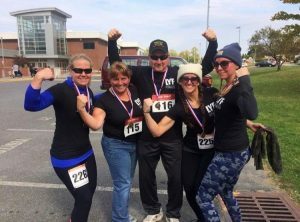 Kylah Campeta, owner of LYF Fitness at 209 Warren Street, is assembling Team Lyf, a team of co-workers, friends and clients, to compete in this year’s Ghostly Gallop. And that’s not all. She’s also issuing a challenge. “I want to reach out to other businesses to create teams, too,” she says. “Maybe they can recruit staff members or relatives to represent their organizations,” she explains. “It’s not just about the race – even though that part is great, it’s also getting a group together to support the Library. The bigger the group, the more fun and the more our Library benefits.” The LYF Team will include about 15 members. To register a team for the Ghostly Gallop 5K, the GG Walk, or the GG Kids’ 1-mile Fun run, go to www.GhostlyGallop.info. The Ghostly Gallop 5K Run/Walk and Kid’s Fun Run is one of our main fundraisers for the year. We’re thrilled when business owners like Kylah come forward to support what we do for the community. The more teams, the better! For more information and to register for the Ghostly Gallop 5K, the GG Walk, or the GG Kids’ 1-mile Fun run, go to www.GhostlyGallop.info. For daily tips to prepare, go to www.Facebook.com/GG5K2017. This entry was posted in Fundraising, News and tagged 5k, Ghostly Gallop, race, walk by Emily. Bookmark the permalink.